To succeed, engineers and other technology professionals need more than technical and scientific knowledge: they also need problem-solving "street smarts." For 20 years, Strategies for Creating Problem Solvinghas helped thousands of them gain these skills. Now, award-winning authors and pioneering engineering educators H. Scott Fogler and Steven E. LeBlanc have updated their classic guide to make it even more relevant and effective. 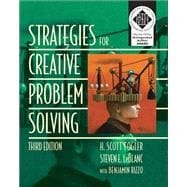 Strategies for Creating Problem Solving, Third Editionoffers a complete framework for strengthening and honing creative problem-solving skills in any technical discipline. It teaches practitioners and students how to: Encounter an ill-defined challenge and systematically identify the "real" problem Generate, compare, choose, and implement solutions Evaluate success, failure, and opportunities for improvement It introduces a proven problem-solving algorithm by presenting a series of graduated exercises intended to familiarize, reinforce, challenge, and stretch readers' creativity throughout the entire problem-solving process. This edition's many improvements include: Expanded, revised and updated examples throughout, including new Fermi examples New material on making the case for change Tighter linkages between problem-solving techniques and real-world applications Even more opportunities to practice, strengthen, and deepen critical thinking and creativity skills The first edition of this book earned ASEE's 1996 Meriam-Wiley Distinguished Author Award. Twice revised since, it's now more focused and useful than ever. H. Scott Fogler is the Ame and Catherine Vennema Professor of Chemical Engineering, an Arthur F. Thurnau Professor at the University of Michigan, and the 2009 President of the American Institute of Chemical Engineers. Fogler has chaired ASEE’s Chemical Engineering Division and earned the Warren K. Lewis Award from AIChE for contributions to chemical engineering education and the 2010 Malcom E. Pruitt Award from the council for Chemical Research (CCR). He is the author of the best-selling textbooks Elements of Chemical Reaction Engineering, now in its fourth edition (Prentice Hall, 2006) and the textbook Essentials of Chemical Reaction Engineering (Prentice Hall, 2010). Steven E. LeBlanc is Executive Associate Dean for Academic Affairs and Professor of Chemical Engineering at the University of Toledo. He previously served as the chair of the Chemical and Environmental Engineering Department for ten years. LeBlanc has served as chairman of the ASEE Chemical Engineering Education Division and as a co-chair of the 2007 ASEE Chemical Engineering Summer School for Faculty. Benjamin R. Rizzo is a production engineer for Shell Oil, working on unconventional reservoir optimization. He is a graduate of the University of Michigan where he received his B.S.E. in Chemical Engineering with highest honors. At Michigan, Rizzo was the Paul S. Bigby Class of 1931E Scholar and was awarded a Landis Prize for Technical Communication. Chapter 1: Problem-Solving Strategies: Why Bother?